Are you the owner of Samsung Galaxy Note 3 and you want wireless charging on your phablet? You should know that Samsung has announced the availability of Samsung S-View Flip Cover pouch in U.S. that brings this feature to Note 3. Of course, the price is slightly steep, the case cost $70 and can be purchased online only, directly from the South Korean manufacturer’s website. 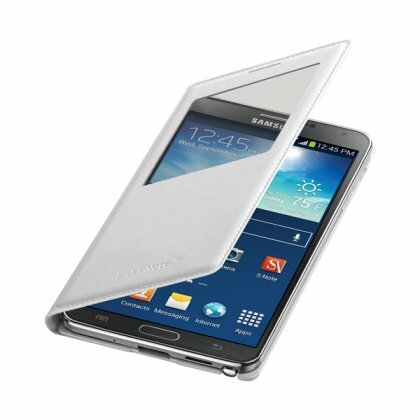 Samsung S-View Flip Cover brings a number of smart features, including access to the notifications panel in the small window, and screen protection against scratches and, in addition, Qi compliant wireless charger. The cover is available in two versions: in the white or black colors, but yet only in the U.S.. Stay tuned for details when it would be available worldwide. So, it’s the end of the year and we hear about wireless charging on our Samsung Galaxy Note 3, how great is that? Soon, we will get rid of all of those cables and everything will be much easier with wireless charging.